As investor relations professionals, we’ve all seen PowerPoint slides that get just a little bit out of control. Too many bullets, too many words, too many pictures – the CEO makes one more addition – and a visual aid turns into a visual Frankenstein. Yes, someone got a little carried away. “When we understand that slide, we’ll have won the war,” quipped Gen. Stanley McChrystal, US and NATO force commander. 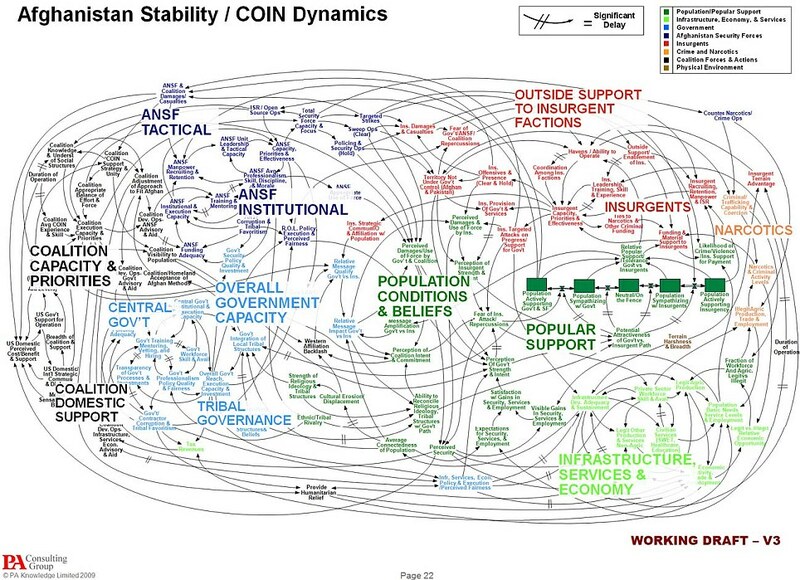 This slide has nothing to do with IR – as far as I can tell – but I have seen graphic concoctions at brokerage conferences that come close to this level of complexity. The spaghetti bowl above reminds me of one “business model” slide I saw. In our eagerness to tell everyone everything, we can become indecipherable. We must remember that IR is about getting people to quickly grasp our story – to understand, not to be wowed by management’s quantum mechanics-style thinking. Consider doing without. Some CEOs tell a more compelling story by simply talking. Depending on the setting, no slides can be very effective. Limit the overall number. Fifty is settle-in-for-a-nap time (sorry if I offend). Twenty is a more palatable presentation for already distracted investors. The marathon analysts’ day is a different story – but, still, don’t get carried away, and build in some breaks from the daylong visual bombardment. Each slide should make a point. It should have a single purpose. The point may be “Our 5-point strategy aims to drive EBITDA,” but the takeaway for an investor is the outcome, more than the 5 individual priorities. Use the 6 by 6 rule. That is, 6 bullets of 6 words each – as a maximum per slide. Even that’s a lot of words. Consider the magic of 3. Some experts swear by the psychological appeal of 3 things – 3 points, 3 bullets, 3 whatever – to make a memorable impression. Graphics or pictures must serve the content. It’s not about eye candy. Visuals must help the listener understand – your finances, customers, markets, strategies or science. Illustrate for clarity. I recognize the culture in some countries – hello, European IR folks – favors more complex slides. Mine is a US-centric view. But the core message still applies. Take two steps back and look at your slides. Use that “View Slide Show” command in PP and imagine you’re a member of the audience watching and trying to listen. Bottom line: Clear and simple tell the story. Here are a few previous ideas on good slides, bad slides and surprises in presentations. What’s your pet peeve or best practice for slides? Browsing a litigation magazine borrowed from my favorite legal beagle – as a non-lawyer, I’m a little put off even by the idea of a litigation magazine – I ran across a neat online resource from Stanford Law School on shareholder lawsuits. Stanford’s Securities Class Action Clearinghouse, in collaboration with litigation consultant Cornerstone Research, tracks shareholder lawsuits, reports recent filings and settlements, and slices and dices data on different kinds of cases. The website is like a special cable TV channel: all securities lawsuits, and nothing but. 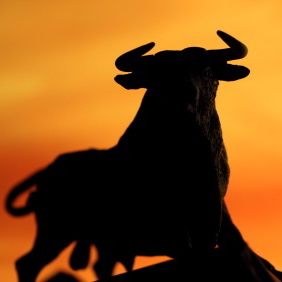 Professor Joseph Grundfest of Stanford Law and John Gould of Cornerstone offer analysis that will interest many investor relations people and corporate lawyers. Not so many securities class actions were filed in 2009, aft er 2008 gave plaintiffs’ attorneys a robust year via the financial crisis. In 2009, the lawyers just about ran out of financial institutions to sue, and some even went back to file suits based on older issues, Stanford says. The high point was 2001, when the dot com bubble turned into a litigation bubble related to IPO allocations. We’re off to a so-so start in 2010. More securities class actions were settled in 2009, on the other hand. This reflects lawsuits filed 3 to 5 years earlier, since it usually takes awhile for both sides to get down to settling. Median settlement was $8 million, but the total was $3.8 billion. The biggest settlements tend to involve alleged accounting violations, especially if there is a parallel SEC action. Also, when the plaintiffs are public pension funds rather than individual investors, settlements are typically higher. Stanford also provides articles and papers on topics like D&O insurance and litigation outcomes and a page of links to news stories and releases. So, for those of you who are intrigued – or scared stiff – by securities litigation, happy browsing!